Many people shy away from sports betting because they think that it is too confusing and takes too long to learn. This could not be further from the truth. 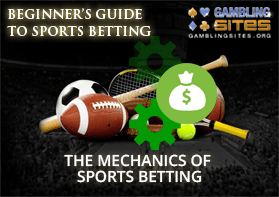 Sports betting is actually quite simple, and we promise by the end of this article you will probably know more about sports betting than a lot of seasoned players. Sports betting at its simplest form is placing a wager on the outcome of a particular sporting event. If you are right, you win. If you are wrong, you lose. Sports betting can be confusing if you want it to be with the less popular more complex bets. However, if you stick to the popular and straightforward bets, it's really easy and a heck of a lot of fun. We're going to walk you through everything now, and you'll be more knowledgeable than the majority of bettors when you get finished reading. At the end of the day, all sports bets are made up of the same three components. No matter which way you slice them or how complex you try and make them, they will always boil down to the following three components: selection, stake, and odds. The selection portion of the bet is as simple as what you are choosing to bet on, or what outcome you think is going to happen. You can't just say, "I want to bet on the Superbowl." You have to select which team you want to bet on or what specific outcome you'd like to bet. We'd love to find a way to sound smarter and overcomplicate this, but unfortunately, it is that simple. The different selections you can make are also known as the different types of bets you can make. The stake is a fancy word for how much you want to bet. If you choose to bet $10 on a game, the stake is $10. This is where we get the term, high-stakes. High-stakes refers to people that are betting large amounts of money. High is the level, stakes are the amount being bet. The stakes you bet are usually completely up to you. Some sportsbooks will require minimum bets of a certain stake and some will impose a maximum bet/stake level. For example, a casino might have a $5 minimum stake and a $5,000 maximum stake. This means that you have to bet at least $5 but are not allowed to bet more than $5,000. Anywhere within that range is good to go. The odds can sometimes be the most confusing part for players. In theory, odds are the likelihood that something will occur. For example, if the odds that you will make a free throw are 1 in 20, this means that for every 20 times you shoot a free throw, you will make one. The odds will determine how much the sportsbook will pay you for your wager if you win. Not every bet in the sportsbook is paid one to one, meaning, if you bet $10 you win $10. Actually, most bets are not paid this way. Sportsbooks will pay you based on the likelihood of what you are betting on occurring. The less likely something is to happen, the more you will be paid if you win. The more likely something is to happen, the less you will be paid if you win. Odds in the casino are usually written as a fraction or as a money line. The money line is a way of writing the odds that is favored for use in the United States. It can be a little confusing if you are new to it, but we will walk you through it. Once players get the hang of it, most tend to like it more. This means that in a perfect vacuum you are going to lose your bet 10 times for every 1 time you win. In this situation, you are a huge underdog. You are going to lose this bet a lot more times than you are going to win. Because of that, you are going to be paid much better when you do win. If you were to bet $100, you would win $1000 for a correct bet. The number on the left is the amount you will win for every time you bet the number on the right and win. You will win $10 for a correct bet for every $1 you wager. This means that in a perfect vacuum you are going to win this bet once for every two times you lose. In this situation, you are a small underdog. You are going to lose this bet a little bit more often than you are going to win. Because of that, you are going to be paid better when you do win. If you were to bet $100, you would win $200 dollars for a correct bet. You will win $2 for a correct bet for every $1 you wager. This means that in a perfect vacuum you are going to win this bet twice for every one time you lose. In other words, you should win this bet 2 out of 3 times. You are a small favorite in this situation. You are going to win this bet more often than you are going to lose it. For this reason, you are going to be paid slightly worse when you win. If you were to bet $100, you would win $50 for a correct bet. You will win $1 for a correct bet for every $2 you wager. These payouts may sound worse to you, but that is because you are much more likely to win this bet and should win the bet more often. This means that in a perfect vacuum you are going to win this bet three times for every one time you lose. In other words, you should win this bet 3 out of 4 times. You are going to win this bet more often than you are going to lose it as you are a significant favorite. For this reason, the payouts will be lower when you win. If you were to bet $100, you would win $33.33 for a correct bet. You will win $1 for every $3 you wager. Again, these lower payouts are as a result of the fact that you are much more likely to win this bet more often. Don't worry if these payouts for the favorites have you turned off. There are plenty of ways to bet on the favorites that pay out well. Most sports will fall into two categories when it comes to odds offered and how they choose to pay out. If the sports have a point spread (which we will discuss), they will fall into one category. If the sports do not have a point spread, they will fall into a different category. For purposes of explanation, we will be looking at straight bets to show you how these two categories work. The straight bet is the most common bet you will see in sports betting. Commonly referred to as a "side" bet, this is picking in advance which team will win the game. The selection for this type of bet will always be who the winner of the game is going to be. The odds and payouts on straight bets are dependent on the sport that you are betting on and which of the following two categories it falls into. Sports like baseball, boxing, and UFC typically do not offer point spreads. A point spread is how many points the sportsbook thinks that the team will win by. Obviously, this won't work for sports like UFC and boxing where people only really care about who wins, not the judge's scorecards (if the fights even go that long). Sports like baseball are too volatile for sportsbooks to set an idea of how many runs a team will win by so they treat them the same as boxing and UFC regarding betting. If you are betting on a sport with no point spread, you are always going to be betting on which team will win the game outright. It doesn't matter by how many points or runs they win by, it just matters who wins. Because of this, the games will always be paid according to the money line odds that we discussed earlier. If you choose to bet $100 on the Yankees, you will win $10 if they win. No matter if they win by one run or by 800 runs, you will still receive the same profit of $10. If you chose to bet $100 on the Worst Team Ever to win, you would win $700 if they somehow pulled off the magical upset. Again, it doesn't matter if it is by one run or 3000 runs, you still would receive the same profit of $700. Obviously, this payout sounds amazing, but you must remember it is so high because it is that unlikely that this team would win the game. Bets like this can be fun to throw a small amount on an underdog. $10 here would win you $70 if they pulled it off! We should discuss what a point spread is first before we talk about the odds and payouts associated with them. In a lot of games, the sportsbook will figure out how many points they think that one team is going to win by. This will be depicted by a minus or plus sign and a point total. This is also sometimes referred to as the spread. A minus is applied to the team that is the favorite, and the plus is assigned to the team that is the underdog. The underdog can lose the game, and you can still win you your bet as long as they lose by less than they were supposed to. This means that if both teams perform as predicted, the Cowboys will win by exactly seven points. Let's say you elected to pick Dallas to win this game. There are three outcomes that can occur. If Dallas wins by 8 or more points, you win your bet. If Dallas wins by exactly 7 points, your bet is a push (tie). If Dallas wins by 6 or fewer points or loses, you lose your bet. Every straight bet using the point spread is paid out at -110 odds. This means that no matter which side you pick, you will receive $100 for a correct bet for every $110 you wager. This difference in payout is what is known as the house juice. It's where the casino makes its profit on your bets. Let's take a look at one more example to make sure you understand this. The Cleveland Browns are playing the Atlanta Falcons on Monday Night Football. The sportsbook puts out the following odds for the game. You might be asking yourself where the point spread or line for the Browns is. Often, casinos will write the point spread for one of the teams assuming that you can figure out the other team's line. It will always be the exact positive or negative opposite. If the Falcons are -14, then the Browns are +14. Some casinos will list both, and some will list only one. Let's say we choose to bet $110 on the Browns. The Browns play well but end up losing the game to the Falcons. Guess what? We still win! The Browns were +14 which means that they only had to lose by 13 or fewer points for us to win our bet. Our $110 bet nets us a profit of $100. (Sorry Brown's fans. We can't even let you win a game in our hypothetical examples). Once you have a firm grasp on the basic components of a sports bet, you're lightyears ahead of a lot of players. All of the different betting options will follow this recipe with some differences in what you are choosing for the selection criteria. If you're looking to get started right away, you can start with the straight bets and those will keep you entertained for a long time. A large majority of sports bettors will only bet these type of bets as they are fun and easy to follow. They also still give you the ability to win big. If you're ready to get started betting, check out our next article on how to go about placing a sports bet.